This mesage from Divinity Roxx is filled with love, light, and many continued blessings for the recipient. I know its been a minute, but I been goin in and I been goin hard! The shows in Belgium were dope! You should’ve been there! We did ONLY High energy shows and had a BLAST! That Belgium Coffee had me able to do 3 encores some nights. That’s how they do it at the Boogie Woogie. Ain’t nothin like some good ol Belgium Beer and if you know me, you know I love beer, and what goes best with beer than the Belgium Friteur (that means BANGIN FRIES). They really do ‘Ghetto Rock’ in Belgium! Who knew?! I do now, and if you don’t believe me scroll down and check out the video Tunisha Singleton put together of the ‘Ghetto Rockin’ part of the show! 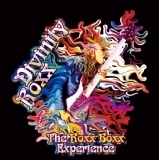 We definitely brought the ammunition, and blazed everybody with the Roxx Boxx Experience. The band included my homies from Belgium, Babl (keys), Remi (guitar), and Patrick (drum and beat master). I miss them so much and wish I could take them everywhere with me! I appreciate all the venues that booked me for the shows, especially The Live Music Cafe in Brussels, Boogie Woogie, Buster (Antwerp) and The Charlatan (Ghent). We rocked our ROXX BOXX EXPERIENCE HOODIES everyday in honor of TRAYVON MARTIN and the tragedy that happened. I played the Black Women Rock Event in Detroit right before jumpin on that long plane ride to Europe. Special shout out goes to Jessica Care Moore, Joi, Yahzarah, Stefanie Christina, The Wright Museum of African America History, the BWR Orchestra and all the ladies who work hard behind the scenes to make the event a success. If people didn’t know before, they certainly know now that BLACK WOMEN ROCK! Back Women Rock on the Detroit River Front Festival. Like I said, I been goin hard. After Black Women Rock, I jumped on my favorite airline, Delta, and took that long long flight to Germany to hang out with the Warwick Famalam for the 2012 Musik Messe. Messe was dope as always and I got to hear some great music and hang out with the legends, Steve Bailey, Jonas Hellborg, Lee Sklar and of course the one and only T.M Stevens. These dudes have contributed to most of the classic music you hear on the radio, in commercials, on tv shows and in movies. Its always dope to pick their brains over dinner and wine and hear some of the stories they tell about their lives on the road with legendary artists like Dizzy Gallespie, Phil Collins, and Miles Davis, just to name a few. I also flew to Toulouse, France where I did a Master Class at The Mairie de Grenade sur Garonne Music School. That is always nerve-wrecking for me, Master Classes. It was fun though and athough I was tired and a little homesick by then, we made it a great time. After about 23 hours of straight sleep, I got back up and knew I had to go even harder. I hit up the Core DJ’s Mixx Show Live Event in Dallas, TX. They always do it BIG in Texas as you may know, and Core DJ’s did it real big. I took a dope picture with Scarface when they gave him a Lifetime Achievement Award. He told me he played guitar and bass. 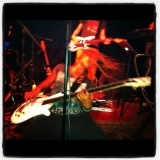 I challenged him to a bass battle, but he declined…ha! I appreciate Tony Neal and his team for giving us the chance to GHETTO ROCK the Core DJ’s. Big love to the CORE and all the DJ’s we met including DJ Young Shadow, Green Lantern, Scratch, and Showtime! Looking forward to MIXX SHOW LIVE ATLANTA in August at The W Hotel. After Mixx Show Live, I boarded yet another DELTA flight for the ATL and played ‘The Balance’ at 595 North with Dres The Beatnik, Eryn Woods and DJ Dibiase and DJ Rapko. Of course, we murdered the show. I mean it Ain’t NO OTHER WAY! Tommy Martin was on guitar, and if you don’t know, Tommy was Justin Beiber’s guitar player for his past couple of tours. My man Joey who toured with Mother’s Finest banged out the drums. Yall know how we do…always an all star band! AND FINALLY, YES, I KNOW I BEEN SAYIN IT BUT THIS TIME I’M SERIOUS. WE ARE RELEASING THIS ALBUM AUGUST 24TH NO MATTER WHAT! We’re workin on a lotta cool stuff for the launch of the album in August, so check the Facebook Page, Twitter, and of course YOUTUBE for the promo and upcoming tours we’re planning. We are in the final stages of mixing the record. Its hard to get me to be still long enough to get these mixes done, but I’m focused. Eric Racy and Full Clip Audio are behind me. You are behind me. And there’s only one way to do it. GO IN and GO HARD. will be showing the video in LA June 16th.Click the link to find out how you can come see it on the big screen! Finally, we are launching our ‘Show Us How You Ghetto Rock’ contest on FACEBOOK!We are giving away prizes from TC Electronics, Zoom cameras, and even a BASS GUITAR from WARWICK! CLICK HERE FOR ALL THE DETAILS OF THE CONTEST! 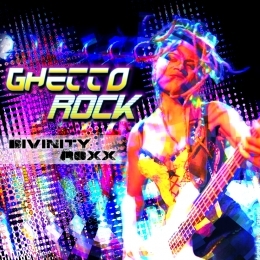 THANK-YOU FOR GHETTO ROCKIN WITH US! TELL ALL YOUR FRIENDS THEY NEED TO GET HERE! Now when we introduce the video we can say ‘Award Winning Video’, ‘Get Here’. Thanx to Director Tony Estes, Producer Eric Anderson, their entire crew and staff for what came out to be an artistic and rebellious video. Shane Bell did the make-up and Renee Hall killt it on the styling/wardrobe. We will release the full video to the public during Sun Set Music Festival 2012. Hope to see all my LA peoples in the place. Details soon come on the video release and performance! For now, check out what we have put together for you to peep into what’s to come. We told you they went hard in Belgium, but see for yourself. Tunisha Singleton put together this Ghetto Rockin video of our travels in Europe. The audiences were electrifying and the shows were, well, GHETTO ROCKIN! Check out the Footage 3rain Ellis put together of the show ‘The Balance’ with Dres the Beatnik and Eryn Woods at 595 North in Atlanta! WE WANNA KNOW MORE ABOUT YOU!We wanna know more about you so we can give you exactly what you want when you want it. Click the image above to fill out the short questionaire. TV Brussels came out to Experience the Roxx Boxx Movement shaking up Belgium. Check out this on-camera interiew with me and Babl (keys). Copyright © *|2012|* *|iRoxx Entertainment|*, All rights reserved.